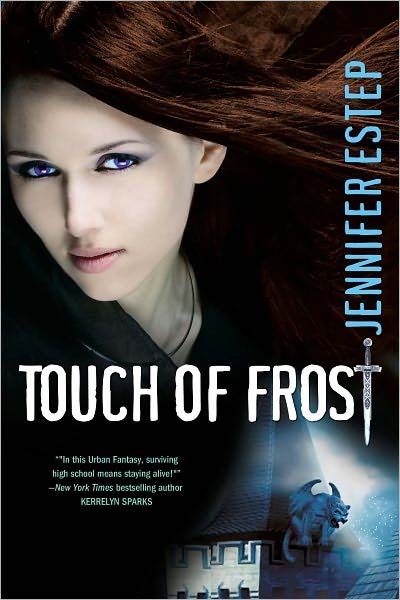 Touch of Frost introduces readers to Gwen Frost and Mythos Academy, school for the descendents of warriors (of legendary fame), where they learn the skills needed to defend the world from the Reapers. Gwen, who isn’t sure she buys the whole “magic” thing, is the new student and a total outsider – a descendent of Gypsies not fantastic beings right out of myth. The only talent that sets Gwen apart is her gift of touch which allows her to pick up memories and emotions from people and objects. However, this gift is also a curse that allows Gwen to see the deepest, darkest secrets a person may possess. When a student is murdered on campus Gwen feels compelled to discover the truth and stumbles into a plot darker than she could have imagined. Jennifer Estep’s Mythos Academy series should appeal to readers who are looking for a more mature Percy Jackson, Tera Lynn Childs or C.C. Hunter novels. The students of Mythos range in age from 16 to 21 and mature activities from drinking to hookups are commonplace (and pretty much ignored by the instructors). This novel starts with a bang and rockets to an epic conclusion without glossing over important plot points or character development. Ms. Estep manages an interesting combination of detail and momentum that will have readers eagerly reaching for Kiss of Frost, the next book in the Mythos series.